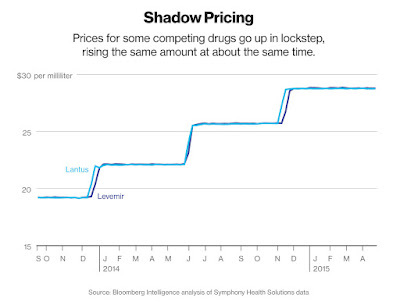 Scott's Web Log: Changes in the Price of Insulin, In Graphics! 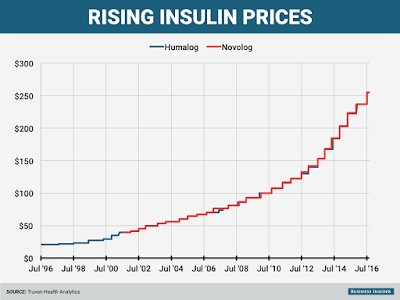 Changes in the Price of Insulin, In Graphics! In September 2016, the media was flooded with stories about the rediculously expensive price of EpiPens, which is basically epinephrine used to treat severe allergies (such as when some people get stung by bees or encounter peanuts), as the pens cost more than $600 for a package of two. The news was that the price of EpiPens had skyrocketed, which is a generic drug with an innovative delivery device that enables even people unfamiliar with doing so to give an epinephrine injection in order to rapidly address allergic reactions. Prices for the devices had increased by 600% over the past decade. Suddenly, everyone was remarkably empathetic to the persons who need to pay more than $300 for an EpiPen. 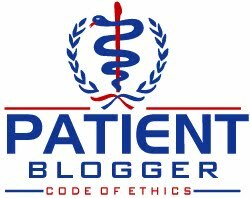 But as I already noted in my preceding post (see https://goo.gl/cWvNRz for my post), that incident was remarkably familiar to people who have to buy insulin, glucagon and supplies needed to manage diabetes. 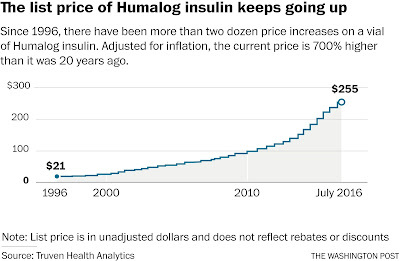 I pointed to a Bloomberg article (see http://www.bloomberg.com/news/articles/2015-05-06/diabetes-drugs-compete-with-prices-that-rise-in-lockstep for that) which showed a sickeningly similar trend of dramatic price increases for insulin (especially) and other diabetes-care items. 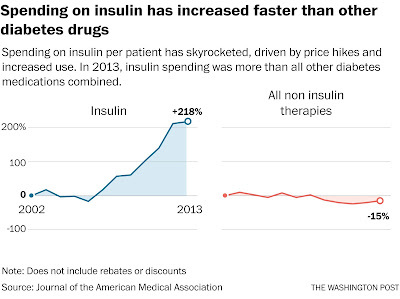 The Washington Post finally addressed this issue with an article of their own (see https://www.washingtonpost.com/news/wonk/wp/2016/10/31/why-insulin-prices-have-kept-rising-for-95-years/ for the article), so did the Wall Street Journal (see http://www.wsj.com/articles/insulin-prices-soar-while-drugmakers-share-stays-flat-1475876764 for the article), and NBC News did so today (see http://www.nbcnews.com/business/consumer/insulin-new-epipen-families-facing-sticker-shock-over-400-percent-n667536 for the article). 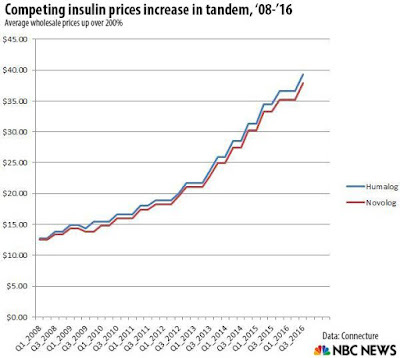 [Finally, Business Insider covered the story on May 15, 2017, see their article at http://www.businessinsider.com/insulin-prices-increased-in-2017-2017-5 for more detail.] One of the articles noted that one version of insulin carried a list price of $17 a vial in 1997 is now priced at $138 today. Another that launched two decades ago with a sticker price of $21 a vial has been increased to $255. Since I've seen some stunning charts and graphs in these articles, I thought it might be worth sharing the story ... graphically. 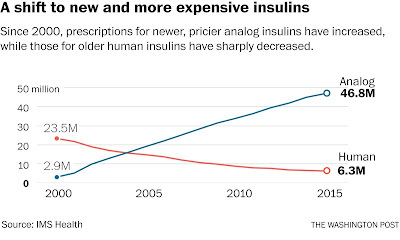 The images below are courtesy of Bloomberg and The Washington Post, the WSJ and NBC News, but paint a graphic picture of what's become of the insulin market in recent years. The trends are even more stunning with these graphics! Note that if you click on many of the charts, that will take you to the original articles. 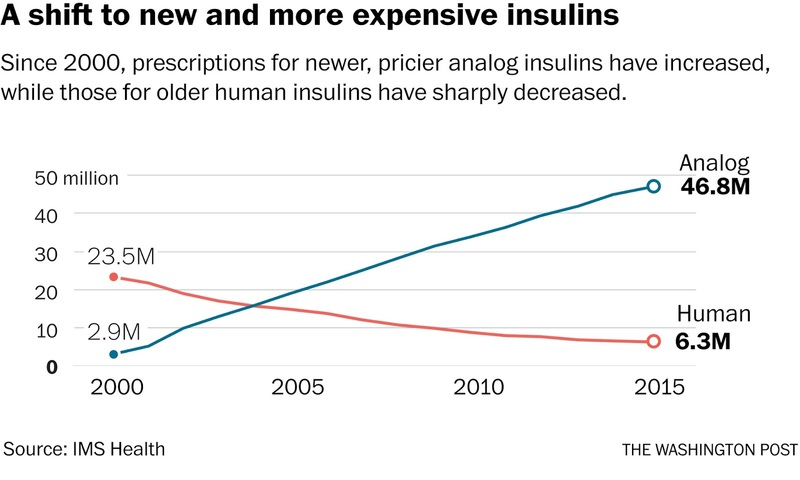 On April 8, 2016, NPR's Science Friday covered the rising prices of insulin in a segment entitled "Diabetes Drug Prices Tripled in a Decade" (listen below, or by visiting http://bit.ly/2mlI95Z for the story). Obviously, the trend from biosynthetic "human" insulin to patent-protected insulin analogs was part of story, but those patents are all expiring. The biggest-selling basal insulin known as Lantus (U-100 insulin glargine rDNA origin) will see the first knock-offs being launched by the end of 2016, and CVS has already pulled Sanofi's costly basal insulin from next year's formularies. Although I hadn't anticipated biosimilars coming from other big pharma players, the fact is that pharmacy benefits managers including CVS, Express Scripts and United Healthcare's own OptumRx unit (which bought Catamaran in March 2015, see the news at http://www.wsj.com/articles/unitedhealth-to-buy-catamaran-for-12-8-billion-in-cash-1427709601 for more) are now pushing for lower prices, and getting them. This has hurt players like Novo Nordisk very badly. The only problem is that the lower prices they're getting come from rebates, so the discounts are invisible, meaning they're done without any changes to list prices for insulin. That's good for big payers, but not so good for the rest of the market. At least one law firm is seeking to have its case against the big 3 insulin makers classified as a class action, and if that happens any insulin user can be a part of the class, so stay tuned for more. For more detail, visit the following website: https://www.hbsslaw.com/cases/insulin-overpricing.